Elite-Select Challenge pool play is in the books, and as we look at how a weather-affected day unfolded, it’s time for an ESC stock watch before Championship Sunday. Let’s take a look at the teams on the rise, the teams holding steady, and the teams trending downward. After taking some time to rev up against Guerrilla in their first game of the day, Sockeye hit a gear that no team in their pool could match. They look in synch and ready to take on the top teams in the bracket. Their offense is hitting its stride, and they looked extremely comfortable working the length of the field with their receivers. The O-line looked much more comfortable in the new offensive scheme than it did back at Pro-Elite, and the defense puts relentless pressure on resets. They have yet to face a true test at the tournament so far, but they are clearly the favorite to win it on Sunday. Madison entered this weekend very much hungover from Championship Weekend in the first round of pool play. 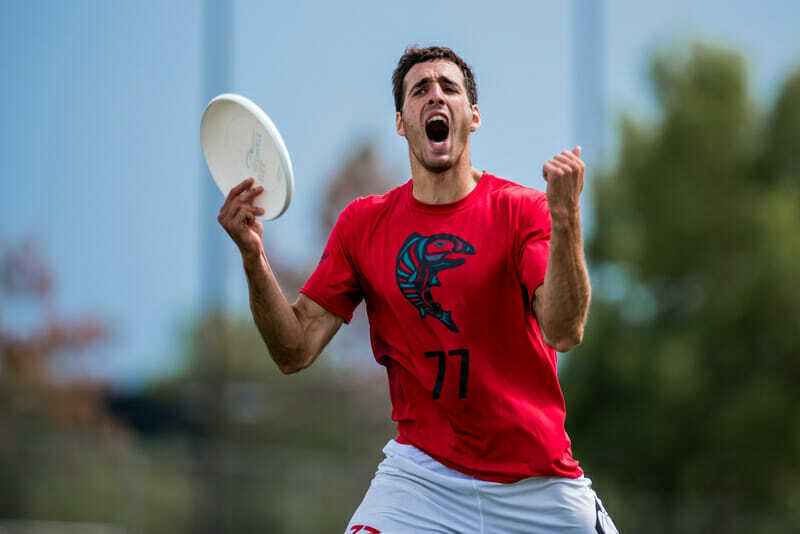 But they progressively turned a sluggish start against 15 seed Montreal Mockingbird into a convincing 13-10 win over Machine to lock up the pool. They accomplished this running a roster of 17 players while playing without their coach, Tim DeByl, who is on vacation. Additionally, Madison adhered to a new system of benching players who had missed practices for a game (at this tournament, three), slimming themselves down to a roster of 16 per game. That’s pretty impressive. They made great defensive adjustments against Machine that generated a lot of break opportunities in the second half. Condors were the best team in pool A, executing a good defensive game plan against Temper’s vert stack and coming back to win close games against Patrol and Turbine. They were extremely efficient on a lot of their break opportunities, and when they need to dial in to mount comebacks against Patrol and Turbine, their D-line offense showed a lot of polish with the spacing of their cuts and the precision of their throws. They need to work on their ability to get takeaways — they didn’t have a lot of break chances against Patrol, and it nearly cost them — but both lines are very tough to stop on offense. Sockeye may have one of the best selections of pullers in the country right now with Christian Foster, Derek Mourad, Matt Rehder, and Ben Snell putting up bombs. We got a taste of how Sockeye could set up their defense with pulls almost to the back line in Colorado, and today they were able to set up several key breaks in their great second half run thanks to the contributions of their pullers. It’s tough to get a read on GOAT with so many high profile players, including Isaiah Masek-Kelly and Adrian Yearwood, out of the picture this weekend. They were out played by Chain Lightning (good zone defense) but delivered a big 13-7 punch to High Five to lock up a spot in the semifinals. Sunday will be a little more instructive as they cross paths with Condors and potentially Sockeye if they advance to the final. There were some great individual moments from the likes of Geoff Powell and Andrew Carroll from their squad, and their defense against High Five was excellent. Chain didn’t look perfect today, but they played exactly how they needed to in order to get into bid territory for the Southeast. They got a signature win against an admittedly understaffed GOAT team, utilizing an effective 2-3-2 zone. Chain will be disappointed not to be in semis: they needed GOAT to win by five or fewer points against High Five to win the point differential tiebreaker, but GOAT pulled off the six point win. Chain has clearly improved since last season. Temper showed some struggles that were uncharacteristic of their performance in Colorado at Pro-Elite. Their offense looked flustered against the Condors, and they lacked efficiency against Patrol in a game that they finally closed out 13-10. Temper has showed they have all the tools this season but against a SoCal team that had clearly scouted their offense before the tournament, they struggled to adapt to a game plan that worked. With the potential for a one bid Mid-Atlantic looming large, Temper will need to be ready for their opponents to gum up their pull plays, lest they face another early exit from the postseason. Much like GOAT, Machine looked a bit incomplete when they finally went up against Madison Club in a game that really challenged their offense. Machine was up two breaks but began to bleed points in the second half. They have some very talented pieces, but they have yet to field a complete team and need to clean up their errors. Pawel Janas, Kurt Gibson, and Travis Carpenter looked great on Machine’s O-line, but there’s still plenty of growth remaining for Machine before the series hits. Getting a full healthy roster on the field is a key first step. High Five’s performance showed just about what you’d expect. They’ve got good pieces and run an effective system, but they have yet to secure a true signature win. They’ve dipped to #16 in the rankings, and they certainly don’t want their path to Nationals to run through Machine at Regionals. The biggest problem today was that their offensive line just coughed up the disc at much too high a rate for this level: throws to nowhere, speculative hucks. Perhaps they’ve got some tweaks to make to the line. Guerrilla’s first half against Sockeye was the best they played all weekend, but that’s about the only positive big picture takeaway for Oakland right now. They did themselves no favors in the bid picture, losing to Indy Brickyard on double game point. Surely they will be happy that the Condors have moved into bid range for the Southwest, but they’ll have to get a lot better to get past them at Regionals. Patrol’s spotty performance today looks to have dropped them outside of the bid cutoff. They have all the hallmarks of a young team that hasn’t quite figured out their offense yet. They could be dangerous down the road against Temper at Regionals, as Patrol lacks the consistency of an elite ultimate club right now. They also struggled, at times, to generate break opportunities. Philly definitely still has that ‘we’ll grind you down’ mentality that can keep them close in games, but they lack that takeover player or two that can get them a key block or score. Comments on "Elite-Select Challenge 2018: Saturday Stock Market (Men’s)"